This post will cover the Samhain ritual and celebration held by the Circle of Fountains. 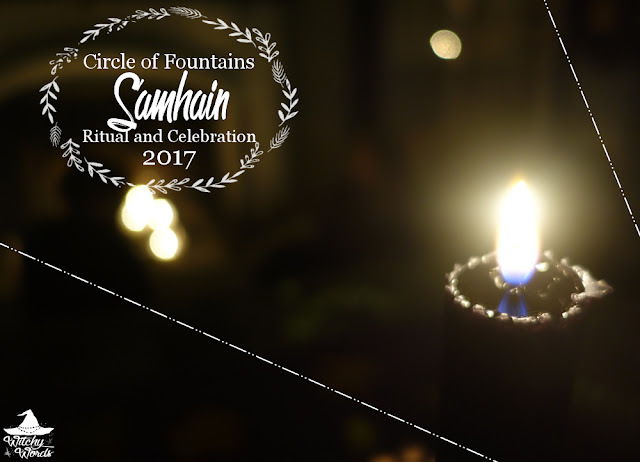 For Circle of Fountains 2016 Samhain Ritual, click here! 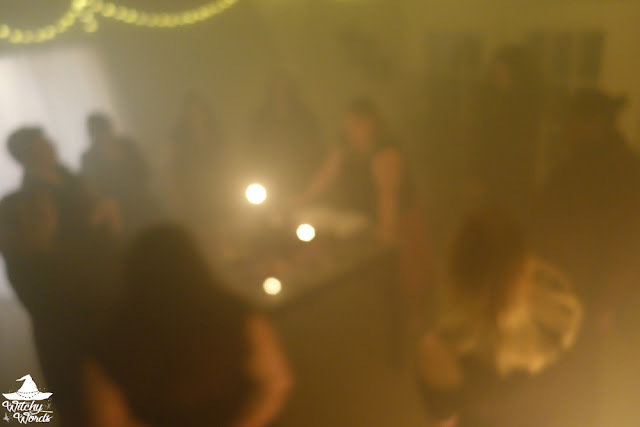 Phaedra led this year's Samhain ritual! Phaedra identifies as a Kitchen Witch with a heavy emphasis on home and family. Our circle prides itself on variety of beliefs and practices, emphasizing those differences as a necessity for community and togetherness. By having members each traversing a different path, we open ourselves up to everything the human experience has to offer. 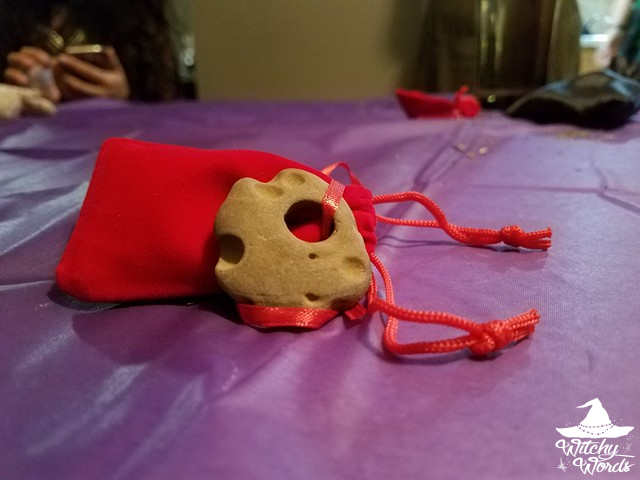 The celebration began by crafting warding sachets to protect ourselves from fae and spirits of the evening. Each sachet was filled with protective herbs and sealed with a hag stone. We then sat down to a potluck dinner that included various foods like lamb, sweet potato pie and root veggies reminiscent of the season. The dinner was held a bit like a wake. Each person was encouraged to share a funny or enjoyable story about the loved one they were honoring that night. Each circle member was anointed with oil upon entering the ritual area. They then placed the trinket of their loved one on one of the altars around the room and stood around the main altar. Everyone was asked to call upon their loved one by lighting one of the candles. Phaedra then silently called the circle by lighting the corner lanterns behind us. Expanding on previous rituals where we wrestled our inner demons and discovered our authentic selves, Phaedra asked that we revel in and embrace our power. We are "stronger than we know and glorious as we are." She then asked us to picture our loved ones in our mind and gently sway to the music, dancing with them as their presence entered the ritual area. We took a moment to tell them what we wish we could have said to them and to listen to what they had to say to us. The Fae have been a strong theme throughout our rituals this year, and Samhain was no different. Phaedra touched upon The Wild Hunt, asking us to offer up something that was not worthy of ourselves - thoughts, feelings, habits and old pains. This was our offering to the Hunt. These offerings, Phaedra stated, would feed the hounds. We then dispersed the circle to forms of divination. From my circle to yours, we wish you a blessed Samhain! To see the previous Circle of Fountains sabbat ritual, Autumn Equinox, click here! I would like to personally congratulate you as your blog Witchy Words has been selected by our panelist as one of the Top 75 Witchcraft Blogs on the web. I personally give you a high-five and want to thank you for your contribution to this world. This is the most comprehensive list of Top 75 Witchcraft Blogs on the internet and I’m honored to have you as part of this! Oh wow, thank you so much, Anuj! What an honor! You all have the prettiest and most comforting rituals. Just so well thought out! Love these posts. Aw, thank you so much, Kim!